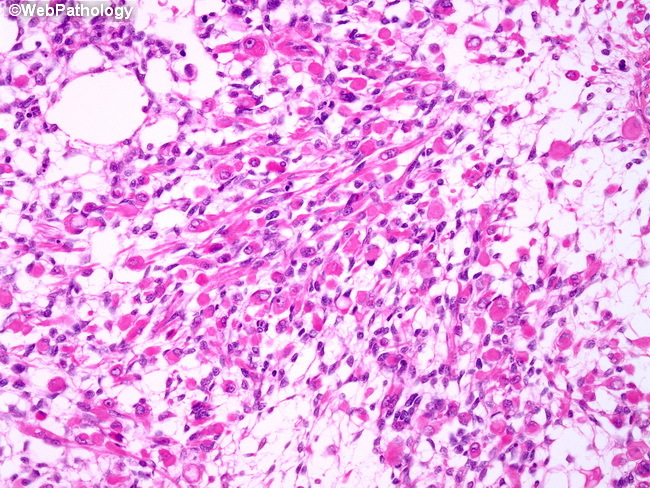 Clusters of spindle-shaped as well as round and oval rhabdomyoblasts in a paratesticular embryonal rhabdomyosarcoma (RMS). The cells have eccentrically placed nucleus with a prominent nucleolus and abundant brightly eosinophilic stringy or fibrillary cytoplasm. Cross-striations are rare in round rhabdomyoblasts. Many cases show degenerated rhabdomyoblasts with glassy or hyalinized deeply eosinophilic cytoplasm and pyknotic nucleus.